Another 81 GPZ. Losing the fat. TOPIC:	Another 81 GPZ. Losing the fat. This is the current project. It's actually running and mostly done for now, but I'm in the tuning stage and getting a little rain delay, so I thought I'de start posting the photos. I started on the frame a month and half ago, but didn't do much else until the last two weeks. I'm just about at the point of being able to ride it. The frame was an old race bike my buddy sold me with three engines. I'm using the one good 82 motor he had which was never raced. The race motor is out to pasture. The frame was a mess. It's had sections welded and replaced several times, but the biggest problem is the kickstand mount was hacked off. So I bolted on some bracing to hold the frame position while I removed the bad section. 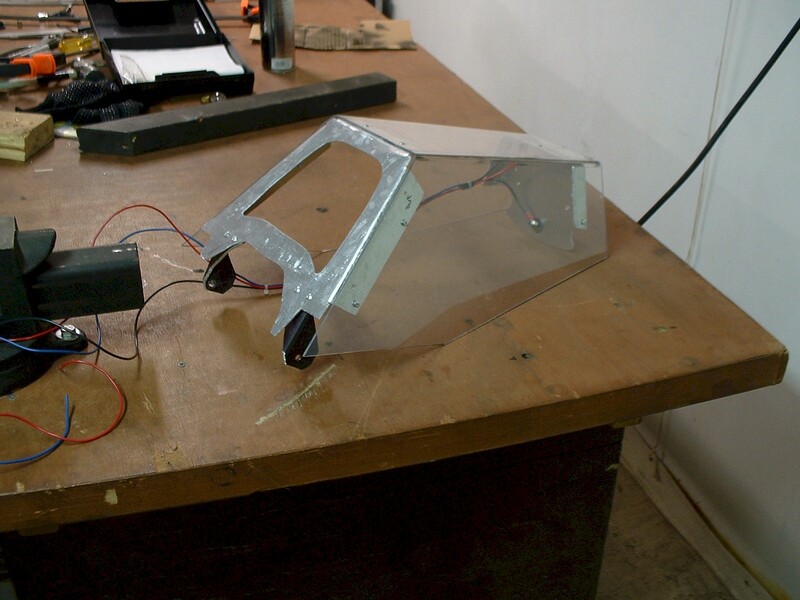 There is a piece of rod tying the two motor mounts together so their distance won't change. It is visible in the after photos. That way, hopefully the motor mount will not move relative to the rest of the frame. Then chopped out the bad. Snagged a section from another wrecked (unfixable) frame. My buddy Travis is a metal fabrication contractor. I do his electrical work and he does my welding. Miller Synchrowave tig. Beautiful work. I painted it right away so it wouldn't rust, but it was so nice it was a shame to cover up the weld. I didn't even have to touch it after he was done. This bike is getting a solo-seat. Battery and starter will be eliminated. 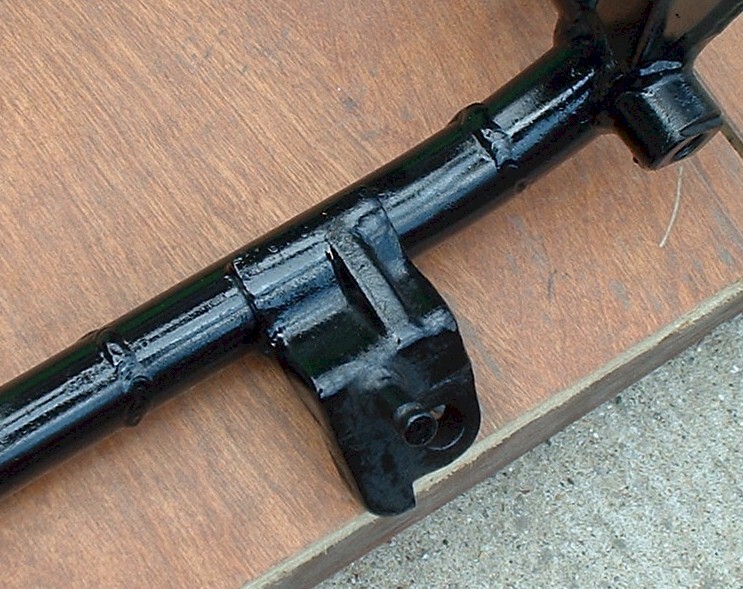 Steering damper. Work shocks. Work springs. 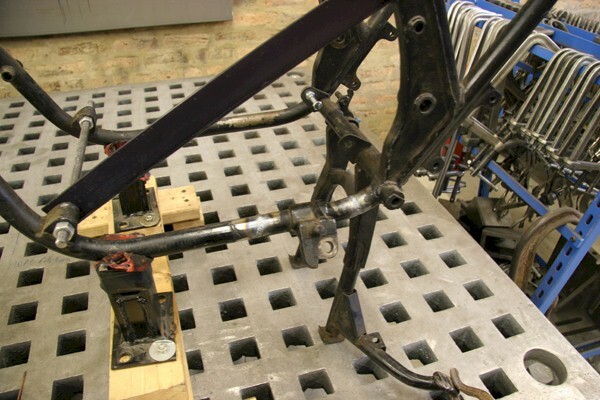 Home made rearsets. Electrical will be almost bare minimum. Hopefully, I'll have about 30 to 40 pounds off of the thing. I mocked up the tail in cardboard. 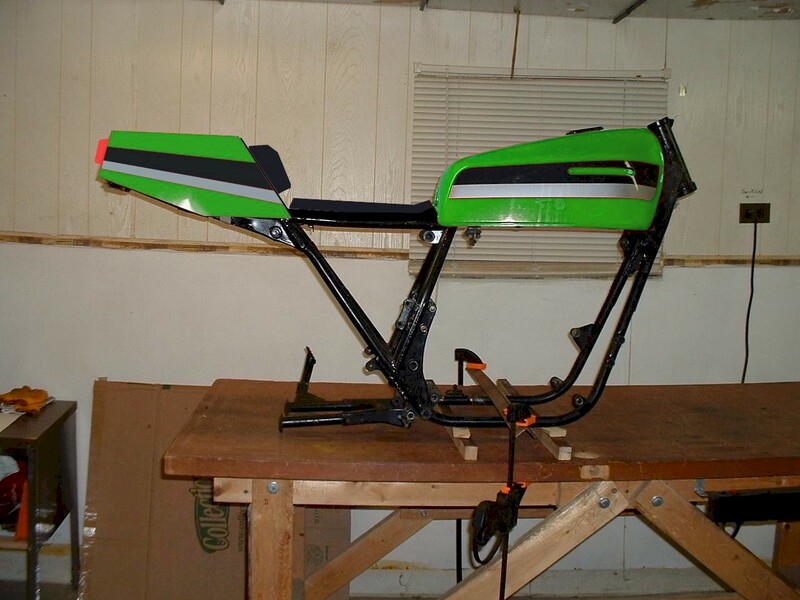 Then I photoshopped some paint and a seat pan. As you can see in the photo, I shaved all of the tabs (some were mangled anyway). 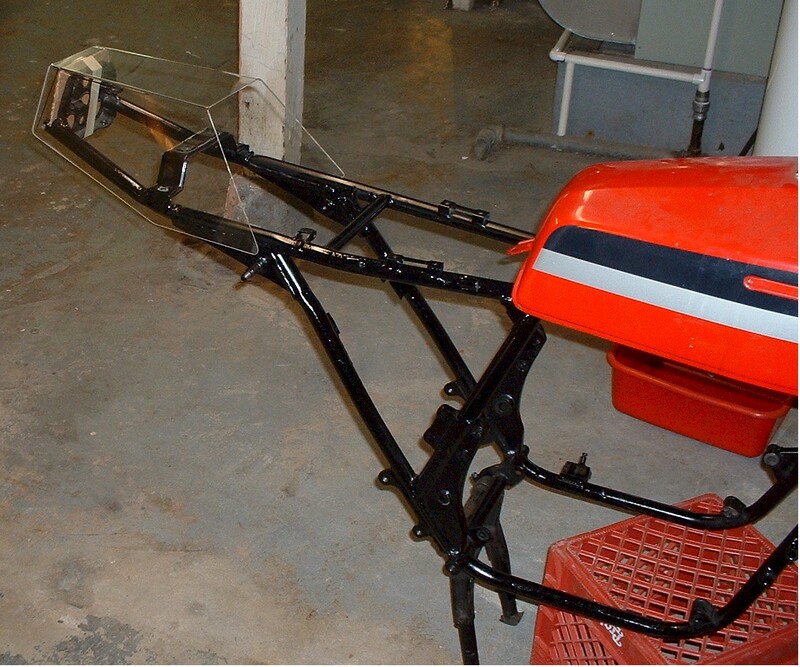 You can also see how the subframe was hack-welded on. It's a crappy mig job. I don't know who welded it. Bottom line is, the sub-frame is all out of whack. I used some pipe clamps and 2X4's to get it straightened. Most of the critical areas (swingarm to steering axis) are now straight. It's going to take some trickery to get the tail and subframe to "look" straight. The shock mounts are a little off, but there's no fixing that without major work. I'll see if it affects the handling before I undertake that job. That's all for now. I have to get outside and start tuning. Here's a green look. That thing is going to be very cool. I think the solo seat will look very trick. 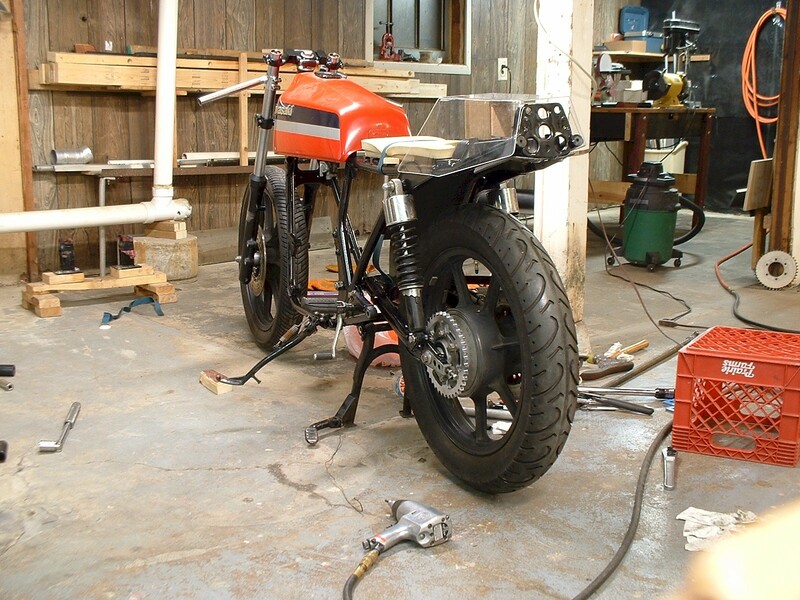 How will you start the bike with no starter or kick? 83 GPZ 550 Stock with 3600 miles_83s. It's going to be a good ol' Flintstone special. Elitist, arrogant, intolerant, self absorbed. I look forward to seeing this one come together! I just taped my harness tonight. I wound up keeping stuff like the emergency lighting device and just relocating everything. I'm keeping my starter, too. I'm too damned old to be pushing my bike, hahaha! Â¡Usted no necesita otra motocicleta! Hey Lou when you photoshop paint on a bike is it fuel resistant? 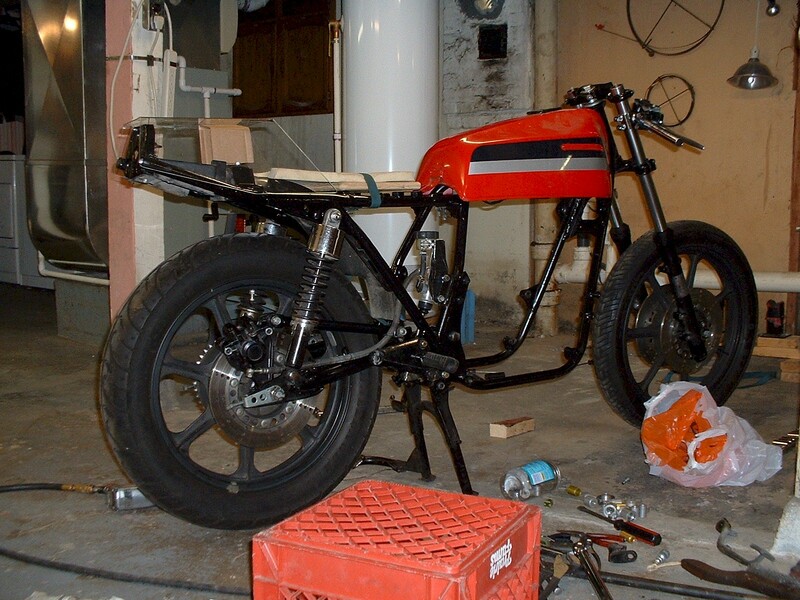 Just kidding the bike is coming along nicely. Only when you use the factory color! Tell me about it. I can't find a decent used Miller or Lincoln tig anywhere for under $1000. But I think I'm going MIG anyway. I'll mostly be welding outside so flux core may be more what I need. I guess the gas blows away too much in the wind. I'm probably going to get the Hobart Handler 140. It's wire feed flux core and solid wire with gas. It comes with everything except the bottle, and it under $400. I've been playing with a Sears hobby welder I found in the attic. 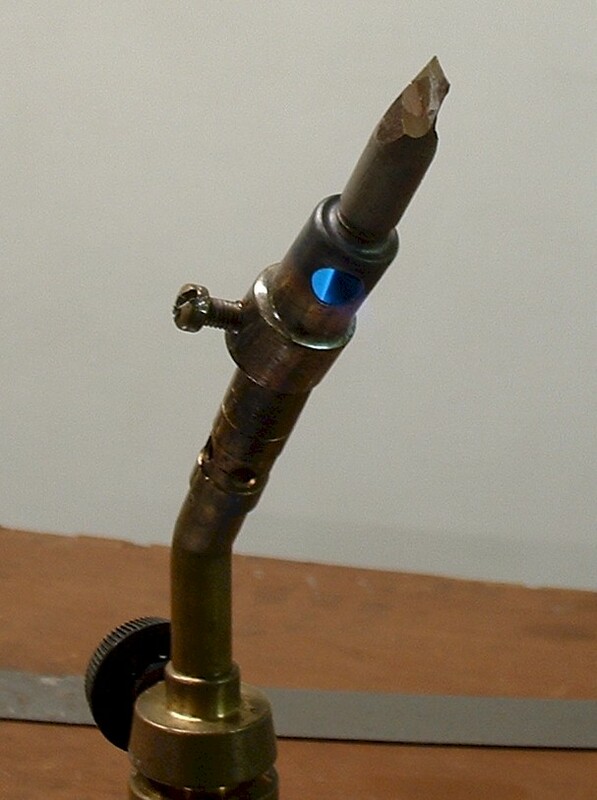 It drives me crazy, but it actually worked on some exhaust pipe. 6013 stick. Do not drill fast. You need a cordless drill at the lowest speed... like 60 rpm. Yes one revolution per second. Do not let the bit get warm because it fuses to the plastic then it shatters. 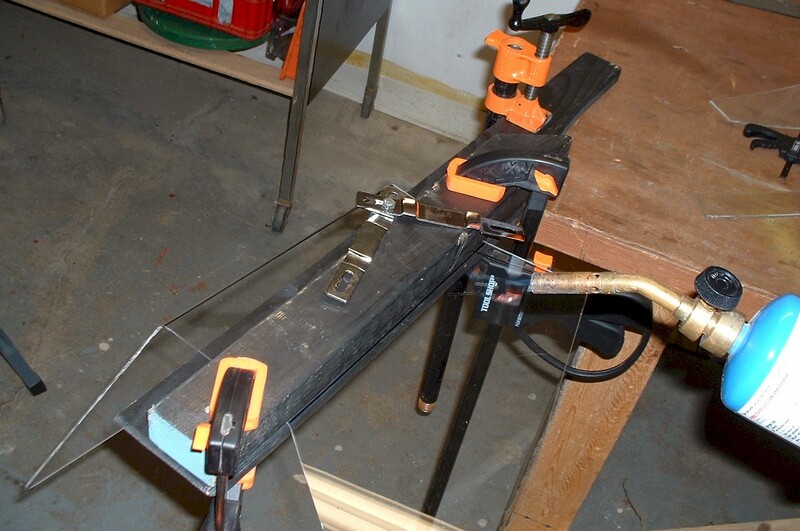 Forget cutting with a jig saw. It just shatters. I also tried scoring it with a utility knife and snapping it. That took forever, and the snap can fracture crooked. The best way to cut acrylic, I found was using a home made hot knofe. I took a propane soldering tip and sharpened it to a knife point. It cuts fast, but not all the way through. You still have to snap it, but it breaks much more cleanly. You have to be careful not to overheat the acrylic. 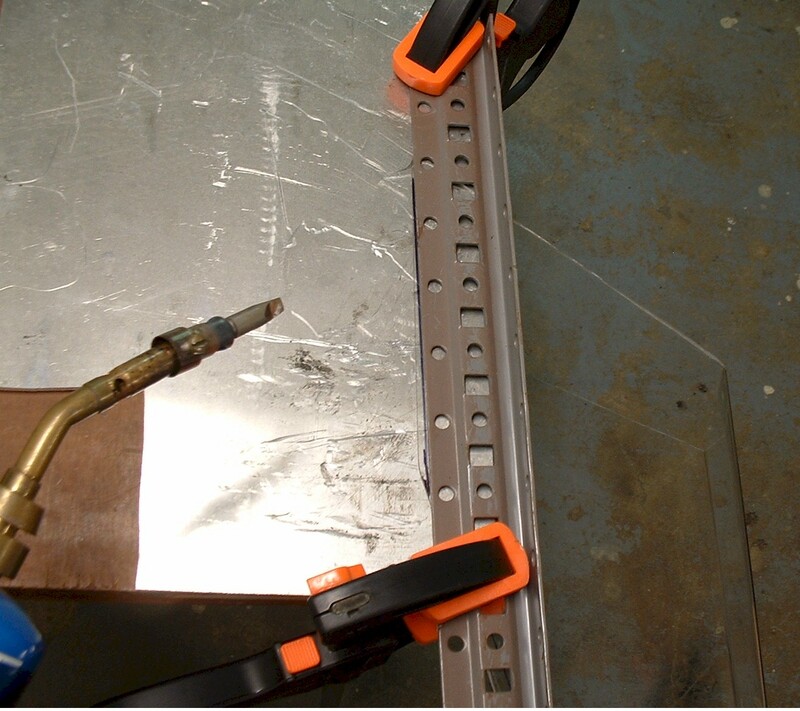 Clamp the plastic with a metal straight edge on top of a metal plate, preferrably aluminum. That takes the heat away from the plastic quickly so it won't bubble away from the cut line. To bend acrylic, I just used a propane torch since I didn't have a heat gun. It works ok, but you really have to heat it slowly . I clamped it between two pieces of wood. I made a mistake in this photo. The upper piece of wood should be set back about 1/4" to 3/8" so the plastic will heat slightly before the bend. On this trial, the bend happened away from the wood form. I routered the lower wooden form to a 1/4" radius to make a nice smooth bend. Wood is good because if it starts to smolder, you know it's too hot, ha. The plastic will blister. (It's actually embedded water that boils to form the blisters.) You need to back away with the flame and move it quicker, back and forth, across the bend line. For polycarbonate (bullet-proof glass, Lexan) forget the torch... it's too hot and will almost always blister. It requires a heat gun, but works the same way, with one major difference. Because the surface is softer, it mars very easily. I ended up with the imprint of the wood on the surface. It's not a problem for my application since I'll be sanding it and painting it. You will want a layer of very soft fabric etc between the wood and polycarbonate to prevent marring. Always bend away from the heat. It takes a good 5 minutes to heat the piece properly. The heat gun can even take longer. The smaller the piece, the faster. So here's the finished acrylic test piece. Only buy the cheaper acrylic for test pieces. It cannot be the final product because it just loves to crack. Acrylic is optically more pure than glass. It's harder than polycarbonate, but it comes with the tradeoff that it's weaker and cracks much easier. Polycarbonate (aka Lexan) is softer and scratches easier. It has a slight tint to it, but it has the huge advantage that it will bend instead of break. One way to tell if you have acrylic or polycarbonate is to look at the edges. On acrylic, the edges will be brighter than the rest of the piece. The pice will be clear with white edges. On polycarbonate, the edges will be darker, like with glass. The final piece should be polycarbonate and it works slightly differently. To cut it, a utility knife works best. Score it about half way through (it's easier than acrylic because it's softer), then snap it carefully. To bend it absolutely requires a heat gun at about 1000 degree setting. (Propane is up around 3000 deg... way too hot.) Polycarbonate drills much easier too. You don't have to go as slow as with acrylic, just don't go too fast or it will overheat and get gooey. So I re-made the tail piece with Lexan (18" x 24" by .093 thick is about $15). Then I put in the aluminum mounts with aluminum and pop rivets. 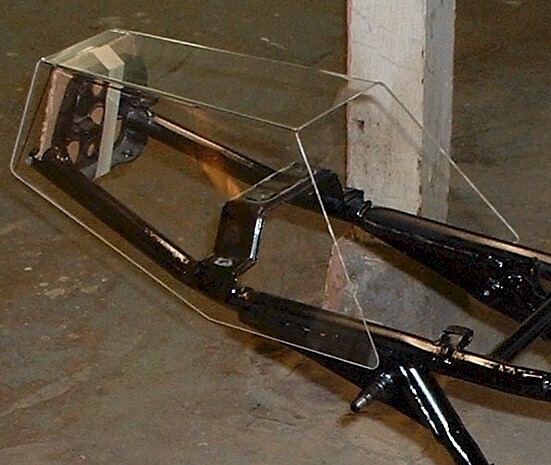 Make sure the holes in the Lexan are one size larger than the rivets to allow for some expansion in the rivet. Notice the plastic is a little darker than the acrylic piece. Here's a cool shot from the rear.